Professor Shintaku has done groundbreaking work on worldwide citrus virus. He now specializes in researching diseases of taro, ginger, and lettuce, all crops of the local agricultural community. 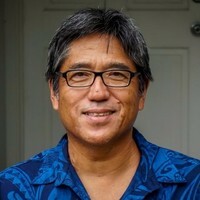 Michael Shintaku is a professor of plant pathology at the University of Hawai‘i at Hilo who teaches plant pathology, plant disease diagnosis, plant biotechnology, genetic analysis, molecular methods in conservation biology, and applied microbiology. 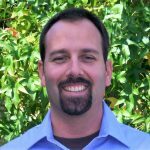 He specializes in plant-virus interactions, with research projects involving tomato spotted wilt virus, cymbidium mosaic virus, dasheen mosaic virus, and the bacterial wilt pathogen Ralstonia solanacearum. 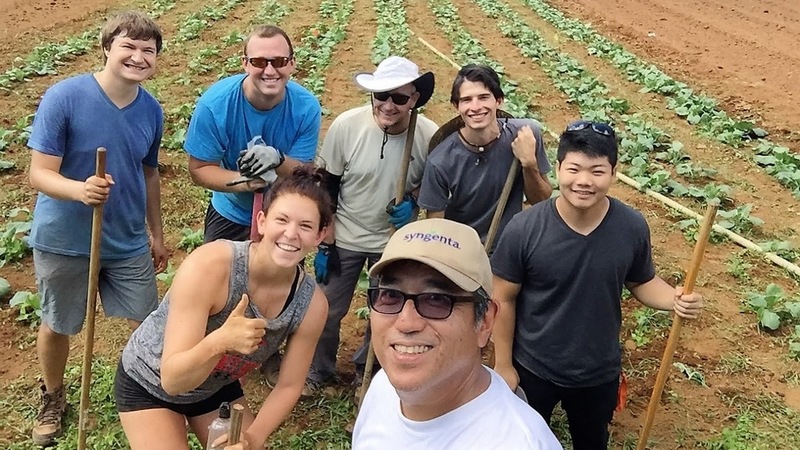 He also specializes in researching diseases of taro, ginger, and lettuce, all crops of relevance to the Hawai’i Island agricultural community. 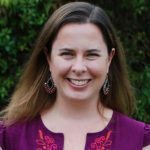 In a landmark study in 2004, Shintaku worked with virologists in California and Florida on the citrus tristeza virus (CTV), a disease that has killed millions of citrus trees around the world causing economic catastrophe in many areas. This was a significant study that contributed a large amount of new information on the biology of CTV. 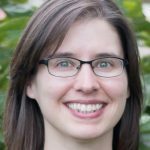 The research team was able to show that the CTV virus carries three suppressors of gene silencing. At the time, gene silencing was a newly-discovered mechanism involved in preventing viral infection. In order to infect their hosts, plant viruses often carry genes that are able to suppress the silencing mechanism. Further, he says, the team was able to elucidate the mode of action of each of the suppressors. The study was published in Proceedings of the National Academy of Sciences USA (2004). Discovering something surprising in plant pathology was not a new experience to Shintaku. In 1991, while working on cucumber mosaic virus (CMV), he showed that by making a single-nucleotide substitution in the CMV coat protein gene, the symptom expression of that virus changed from a green mosaic to a white mosaic. “This was surprising, but more surprising was when we found that this substitution also rendered the virus unable to infect squash and unable to be transmitted by aphids,” he says. This work was published in Plant Cell (1991). Shintaku’s recent work is with taro, ginger, and lettuce, all major crops of the Hawai‘i Island agricultural community. 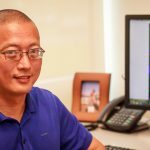 His work on taro has focused on three things: the evaluation of microsatellite DNA markers for taro identification; the identification of single-nucleotide polymorphisms for use in taro identification and breeding; and the use of a detached leaf assay to rapidly evaluate taro plants for resistance to taro leaf blight caused by Phytophthora colocasia. 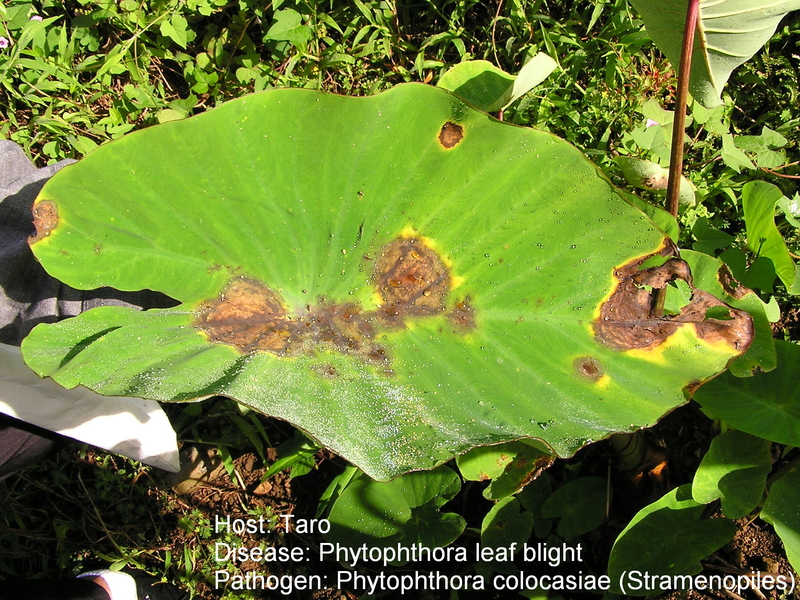 Taro leaf blight caused by Phytophthora colocasia. Photo by Scot Nelson. Using hand-pollination, Shintaku and his research team are developing new varieties while selecting for disease resistance. They have screened over a thousand individual plants from 14 crosses, and have identified two parental lines that confer very good resistance to their progeny. Looking to the future, Shintaku says he hopes to have a DNA fingerprinting system in place for taro in the next year or so. Shintaku also is studying bacterial wilt of ginger caused by Ralstonia solanacearum, the most important disease affecting ginger cultivation in Hawai‘i. Ginger has been extensively grown in the Hamakua district of Hawai‘i Island, so much of the soil there is infested with this pathogen, he says. Prof. Shintaku received his master of science in plant pathology from UH Mānoa and his doctor of philosophy in plant pathology from Cornell University. Originally published Oct. 17, 2012 and updated May 23, 2018.